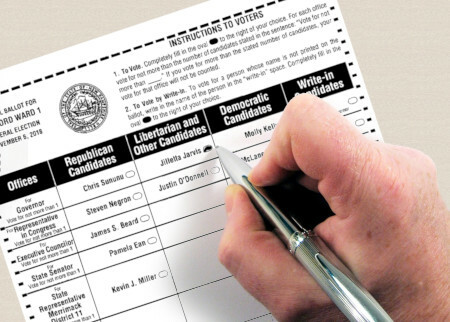 For the first time in twenty years, Libertarians had their own party column on New Hampshire ballots in 2018. Since Democrats took the New Hampshire House and Senate in 2018, it begs the question: did Libertarians "split the ticket" and steal Republican votes in 2018? The answer seems to be "nope." Libertarians ran in 27 state districts in the general election this year. In 8 of those races – including the race for governor – Republicans still won all of the seats. In 10 of those races – including both congressional races – Republicans would still have lost even if every Libertarian vote went instead to a Republican candidate. In 5 of those districts there were no Republican candidates, or fewer Republican candidates than there were seats available. That leaves just 4 towns where it’s theoretically possible that if every Libertarian vote went instead to Republican candidates, the Republicans might have picked up a state representative seat: Bedford, Derry, Goffstown, and Barrington. Did Libertarian votes shift the balance? Although the Secretary of State is still recounting some districts, Democrats probably have at least a 60-seat majority in the House, so any impact of Libertarians on Republican voting did not have a significant impact on the overall balance of power in the New Hampshire House. It’s also not very likely that Libertarians changed the outcome in those four towns. Libertarian voters were already able to vote for several candidates at once, so they may have thrown plenty of support behind Republicans. There's also no guarantee that a Libertarian voter would choose the Republican candidate in the absence of a Libertarian one on the ballot. After all, Libertarians have some very different views than Republicans, especially on drug policy and other social issues. According to state law, a party has to get 4% of the votes for governor or U.S. Senator in an election to get its own column on the ballot in the next one. The threshold used to be lower – 3% – but in 1997 a Republican House and Senate raised it. Libertarians didn’t cross the 4% threshold until 2016, with gubernatorial candidate Max Abramson, which is how they got their own ballot column in 2018. Unfortunately, they did not muster enough votes in the election to keep that status in 2020. While they may not have a guaranteed spot on the ballot anymore, you can be sure you’ll see Libertarians fighting for official party status and running again in 2020. I am highly skeptical of your assessment without justification showing how you determined each member of each party voted. Not all Libertarians voted their party and neither do Democrats or Republicans.